Last time we saw those wacky synth weirdos they were blue; now they are taking over the world! The Corn People have been busy in the months since June doing an album each month of this year. 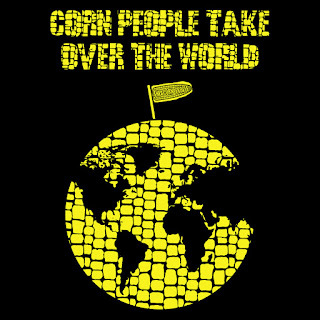 For July, they released Corn People Take Over the World. What a goofy cover this is. Of course, this is The Corn People. As beings from another world, they do not understand our Earth ways of design and aesthetics. This is just the Corn People corn texture overlaid on a planet with black continent silhouettes and a flag with the same texture. The flag looks pretty cool, and the black and yellow is a strong choice. The text is sort of hard to read too. Overall it's pretty cool like a B-movie music album. For an album called Corn People Take Over the World, the first track announces that "We Come in Peace". Is this a lie? Is this a put-on? The music is a combination of maracas and other percussion instruments to an ambient, textural decay. A long drone interspersed with blips becomes more percussive and rhythmic as the song continues. Perhaps The Corn People have just come to dance? "Wandering" is a great track. I love the drum sound, though I wish it sounded more within the same realm as the swooping synths. The short pauses towards the later half bring a lot of climactic tension that pays off with choral light. "Planet Corn" is perhaps where The Corn People came from. It seems like a fast and busy place, almost kraut-rock combined with video games and jungle stuff. Perhaps this is the how the planet is now if we assume that Can and Neu! came from that world as well. Truthfully, of the famous kraut-rockers, this sounds the most like Kraftwerk; that beautiful synth that journeyed "Europe Endless" and rode the "Autobahn" seems to be here, ancient alien artifacts (and I don't mean that poofy hair guy riding the Chariots of the Gods?). Next is "In the Beginning". Is this a concept album about The Corn People's journey to Earth and their adventures here so far? It's a beautiful track that reminds me of Zuntata, Taito's legendary prog band. The melodies are wonderful, soaring clouds and stars. The choppy part in the second half does not work as well as the similar part in "Wandering". The end here is pretty weird but cool. The change in composition is weird but striking, going from a more composed nature to something more amateurish. The same drum parts continue into "Tomorrow", a rumbly jam like a 50s sci-fi theatre, a rush of hot wind thru the High Desert. The rumbling dissonance continues into the wind. A click and then something starts. "Nara Dreamland" announces the second half with false horns and percussive static accompanying your standard drums. The moan of a monster from some lunar asteroid and the chirps of stars like from deep inside an Acid Mothers Temple appear, and then chaos takes over. Apparently Nara Dreamland is the name of a defunct Japanese amusement park; perhaps The Corn People hid out here for some time after landing on our planet. "Pop" is next. Is this how they came to develop their Earthly musick? I assume that The Corn People played musick previously but they may have discovered Yellow Magic Orchestra or the previously mentioned Acid Mothers Temple back in Japan. Maybe it is a statement on pop music, an outlier and the shortest song on the album. "This Was Your Life!" sounds like musick in a game show made with a haunted organ that's rocking back and forth out of control further and further into some strange future. The title makes me think of the TV show and seems like a comment on consumerism to go with the last one. It could also be talking about the changing fortunes of The Corn People. "The Bomb Run" continues with the organing, the fatalistic pounding that the last track became, before being swept over by an air raid siren. It's another in the theme of Atom Age sci-fi storytelling that's been creeping along in a rubber costume. This one really does sound sinister: murmering drones, creaking synthetic tones, an ominous bassline. Finally, somebody returns "Home". I'm not sure who. It seems that they live in a pretty dark place, a crumbling darkness navigated to by ticking hi-hats. Peering out, again I can see the stars, small lighthouses in the abyss. Something speaks. Was it an invasion all along? Corn People Take Over the World is a great album, their best yet, at least for me. I still have four months more to go thru plus the upcoming December Corn People album. It's gonna be a wild ride through the cornfields from here till 2019. I can't say what the future will hold, but the higher production values and killer but corny songwriting ensure that Corn People Take Over the World receives a Good.